The Kodak Professional TRI-X 400/400TX Black-and-White Film is a high-speed panchromatic film that is a good choice for photographing dimly lit subjects or fast action. It is also an excellent choice for photographing subjects that require good depth of field and fast shutter speeds, as well as for extending the distance range for flash pictures. 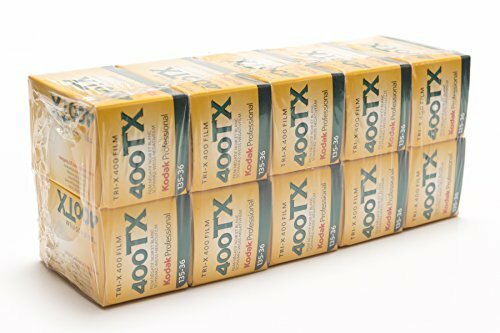 This roll of TRI-X 400 film (400TX) is a 35-millimeter roll and is recommended for push-processing applications. TRI-X 400 black-and-white film delivers fine grain that is good for producing high-quality images; wide exposure latitude for rich tonality maintained with overexposure and underexposure; high sharpness that is good for applications that require a moderate degree of enlargement; and a high resolving power for a good rendition of detail. All of these features makes the TRI-X 400 film an excellent choice for professional black-and-white photographers.